In the winter of 2013, Sulsaemit Shrine, a traditional place of worship for followers of Jeju Island’s native shamanic religion, was deliberately desecrated at the hands of unknown culprits. I have written about our group’s (the Senjari Rangers) efforts to restore this natural sanctuary where people in the area have worshipped for some hundreds of years. Now, in the face of economic and tourism development, such heartbreak has spread to other villages around the island. More traditional shrines are under attack. One such shrine is the Ilryue Shrine in Seongsan Village, home to Unesco designated Sunrise Peak, a dormant volcanic crater which looms over the area. 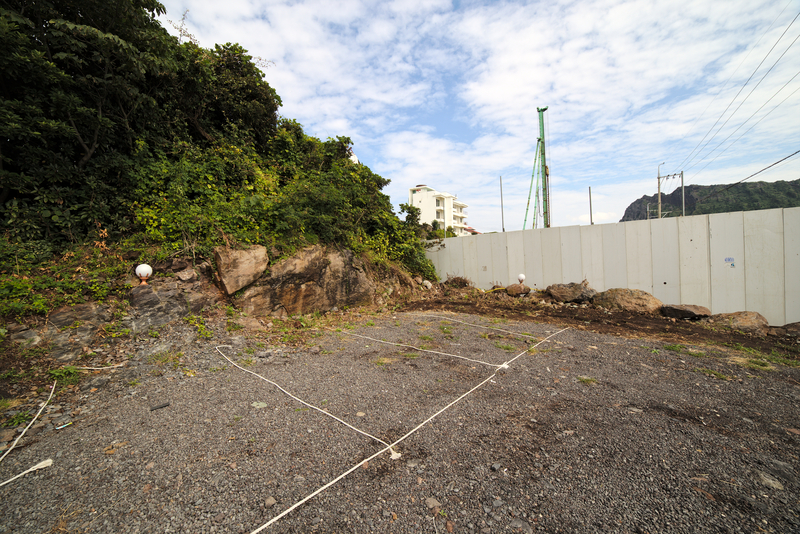 It’s been three years since the shrine was destroyed to accommodate for two spaces in a hotel parking lot, leaving local women divers (haenyo) without a shrine to pray in. The divers are a main feature in the town’s burgeoning tourism industry. A view of Unesco designated Sunrise Peak in Seongsan Village, Jeju Island. The Irlue Shrine, where the women divers (haenyo) of Seongsan worship, was paved over to create two parking spaces in a hotel parking lot. The divers’ image is used to promote tourism in the area, yet their sacred sites aren’t being protected. On the morning of the 25th of September, Tommy Tran, a doctoral candidate at UCLA, and I took the coastal bus along with some fifty or sixty tourists to the far eastern point of Jeju Island. We drove out past Jongdal-ri, Hado-ri and Sewa-ri. These are names of villages where I’ve spent an ample amount of time over the last four years interviewing shamans and resident practitioners of muism. I’ve spent many early mornings filming rituals in these villages where shamanism is still very much alive. Tommy and I had heard that a traditional shrine had been built over in Seongsan, home of famed Sunrise Peak, a natural feature of the fishing town which has geared its economy towards tourism since the giant volcanic crater (inactive) that shadows the area received Unesco designation. We arrived in the village with a mass of tourists, the majority of which were Chinese nationals. We quickly found Seongsan’s modest town hall. The office manager on duty confirmed what we had heard. A hotel owned by outsiders to the village had removed the Ilrue shrine. In its place a parking lot had been installed. Ilrue shrines are a type of shrine in traditional Jeju shamanism where typically women go to pray for the health and prosperity of their children. Grandmother goddesses, who both heal children and act as guardians in the village, inhabit these shrines. We discovered it had been some three years since the shrine had been removed without notice. The local women divers, we were told, had experienced a considerable amount of grief over the matter which hasn’t yet been resolved. At the women divers workshop, we spoke with four senior divers. While the boost in economy, due to the swell of tourists in recent years, is a welcome windfall for the women, who make their living performing the traditional occupation of diving for abalone and other seafood, they expressed disgust at the hotel owner for his actions as well as local authorities for allowing the affront to happen. “This wasn’t a random event,” said one local diver, “they knew that it was a shrine. They knew what they were doing.” No one, we were assured, had tried to help them. During the conversation, we were interrupted several times by tourists who needed directions. The local and extremely popular Olle-Gil (Olle trails are a system of hiking paths on Jeju Island) runs right by the doorway of the workshop where the divers regularly process their catch after coming in from sea. No doubt the walking course had been designed to feature the divers, who are the subject of many pastoral fantasies in the minds of visitors to Jeju. What wasn’t visible on the surface was the pain they had endured over the removal of the shrine, which could have well been hundreds of years old. As we walked around town, I took note of the fact that the divers’ image was being employed to provide local color for tourists. We left the divers at their workshop. I wished to talk to other residents of the village more in depth. Women divers (haenyo) gather for a shrine ceremony to honor the Youngdeung Grandfather God. Next, we visited a retired diver in her home. Mrs. Park (91) recalled attending the shrine with her mother to make an elaborate offering to the Irlue Grandmother Goddess, to treat an illness in the family. She herself had visited the shrine many times over the last nine decades. 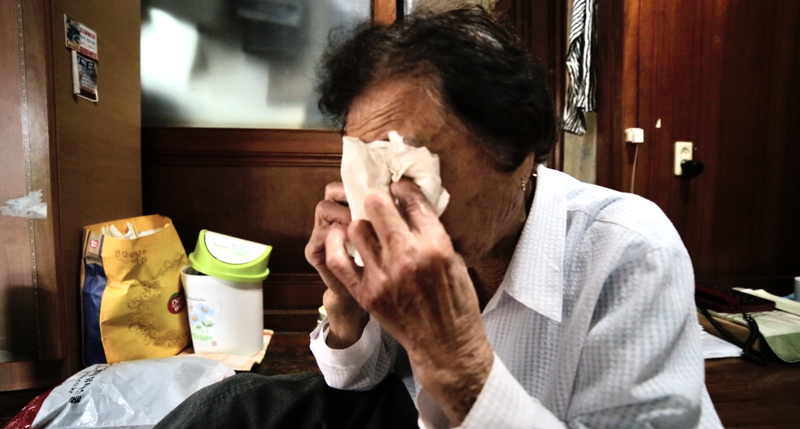 Mrs. Park said that she hadn’t experienced any dementia or memory loss even at her advanced age, but worries, that without the aid of the shrine grandmother, she might start having symptoms. She had seen many others go through the horrors of cognitive disorders, which affect many elderly divers. She suspected, as well, that the fact that the Goddess had been uprooted from the shrine might be the cause of several unusual deaths in the area. 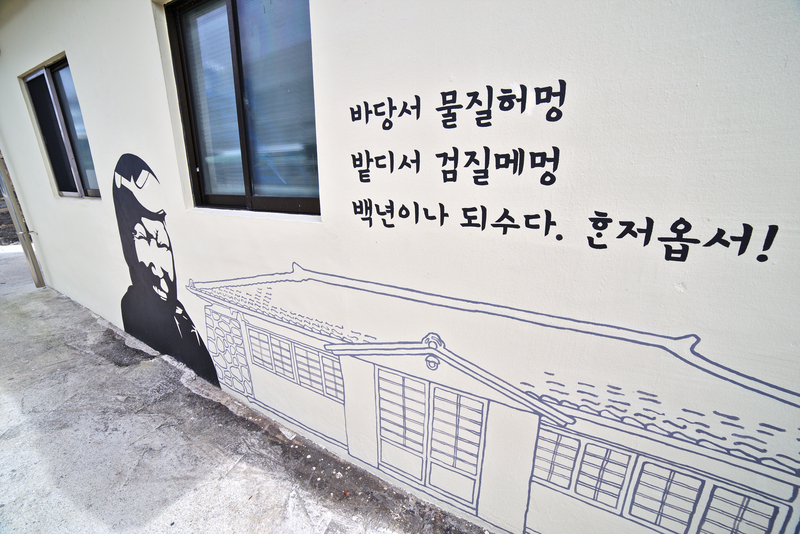 “You can’t have a village without a shrine,” she said in Jeju-eo, Jeju’s native language. She had tried to appeal to local authorities to do something about the situation to no avail. “Everyone listens,” she said, “but no one helps.” She asked if we were going to do anything helpful or just listen like everyone else. Mrs. Park broke down into tears a couple times during our visit. Elderly divers are often people of absolute faith. The idea that a shrine has been disturbed is a source of anxiety she’s been living with–anxiety about her future and the future of the village. 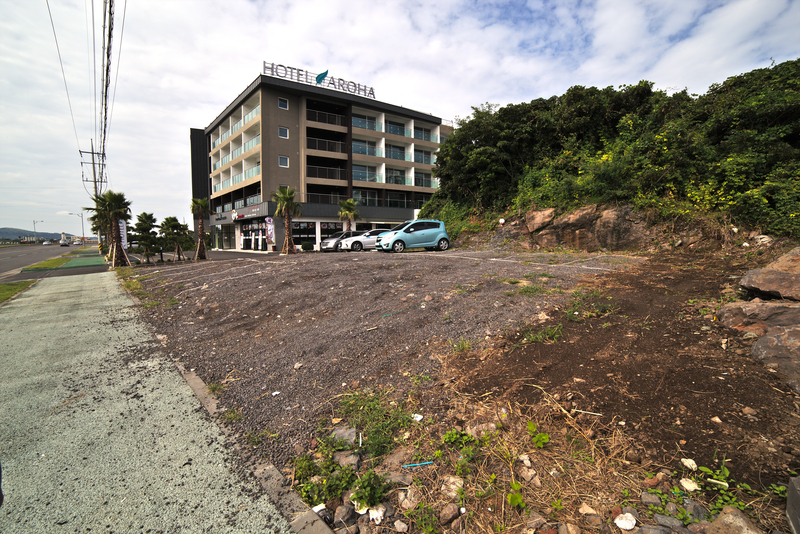 The Irlue Shrine, where Mrs. Park, a retired ‘woman diver’ (haenyo) worships, was paved over to create two parking spaces in a hotel parking lot. The elderly in the village no longer have a sanctuary in which to pray. 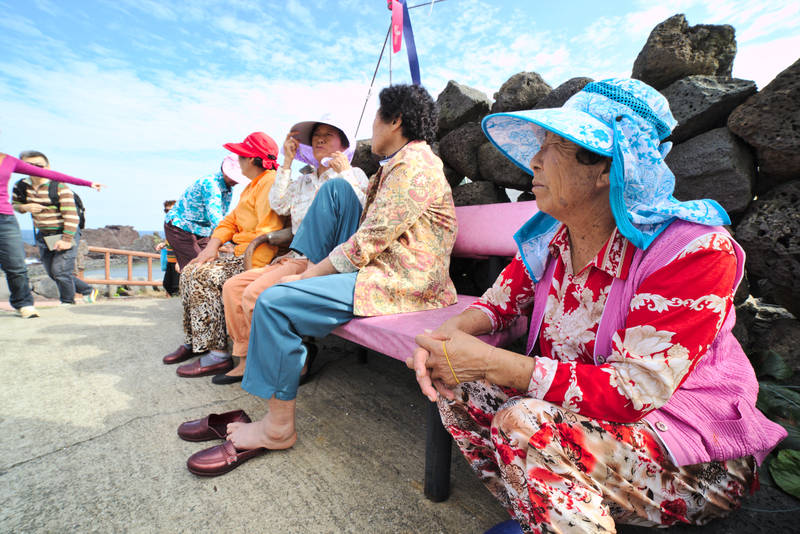 The elderly generation, as well as many in their forties and fifties, who work at sea or in agriculture, are devout practitioners of Jeju muism (shamanism). Communities such as Seongsan have experienced a great deal of trauma in the past due to the effects of the massacres that took place during the April 3rd Uprising (1948), where some 30,000 residents of Jeju, accused of being communist sympathizers, were executed at the hands of the national government. Shamanism is considered to be one of the primary devices of psychological treatment for survivors, so much so, that material on the value and role of ritual in the healing process has been included in conferences held at local hospitals. Shrine worship, just one aspect of shamanism on the island, is an integral part of traditional residents’ lives. Making an offering at the Goddess Geumbaekjo’s shrine in Songdang Village. Why not rebuild the shrine? It’s a good question, and as it turns out, the answer is quite nuanced. Often I hear how muism isn’t a religion which holds fast to standard rules. Yet they’re never practitioners of the faith who make comments along these lines. In reality, muism’s rules are rather concrete and rebuilding a shrine requires a shaman to ‘move the god’. A ceremony must be held to ask the god’s permission to move or to coerce the god to do so. It is important to the psychology of the village for residents to be certain that the deity is actually situated in the shrine. There has been a case in Jeju where this sort of ritual was insufficiently carried out. 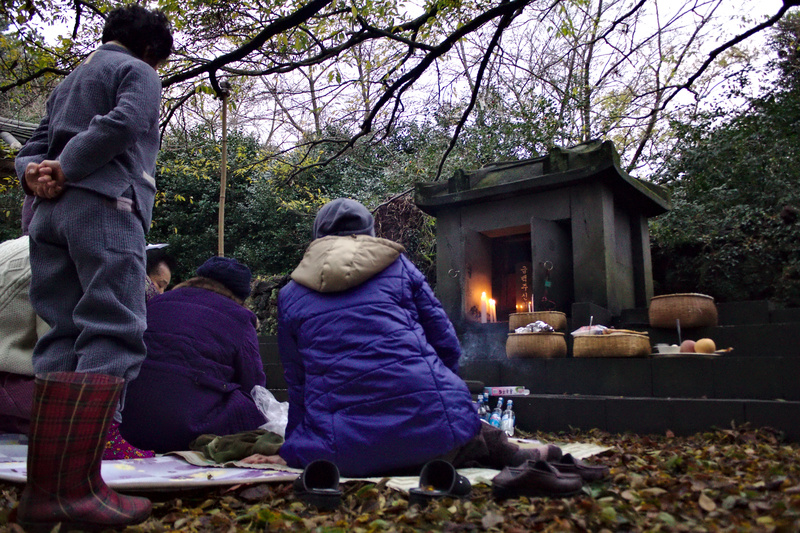 Residents kept worshipping in the old shrine site until the ritual could be done properly. There hasn’t been a traditional shaman responsible for Seongsan for some years now, which further complicates the issue. The ‘myths’ of Jeju are precisely the shrine myths which describe the origins of the gods therein. There is another concern, as well. The neighborhood in which the shrine stood is almost entirely occupied by hotels and businesses, hardly the right ambience for a sanctuary. Ironically, many of these businesses use the divers’ image to promote to their clientale. 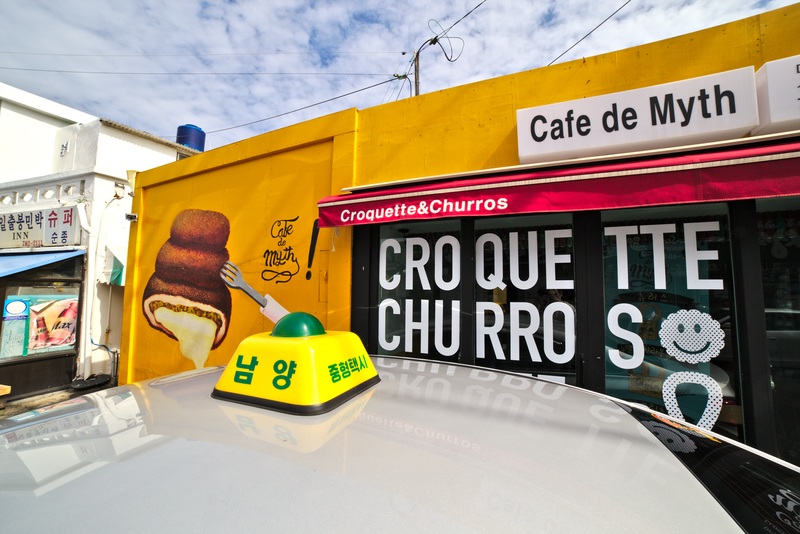 Many have artistic renderings of the divers on their signs and spatterings of Jeju language. One establishment is even called Myth Cafe, perhaps playing on the idea that Jeju is an island of myth. I wondered if the owner knew that the physical marker that embodies the village’s myth had recently been destroyed. The ‘myths’ of Jeju are precisely the shrine myths which describe the origins of the gods therein. Local businesses often employ use of the divers’ image to promote a local atmosphere. Little do they seem to know (or care?) that an actual traditional site valued by the divers in the village has been bulldozed over. The Ilryue shrine in Seongsan, as it turns out, was situated on private land, a worrisome fact. After all the time I’ve spent following the story of the people who worship at Jeju Island’s shrines, during the filming of my documentary project on the topic, I’ve come to put great value on these historic santuaries. I believe that every shamanic shrine in Jeju should be protected by law and that the secular portion of the population be educated about their cultural and historical value. I had assumed before, wrongly so, that from mythic time onward, the shrines were located on small plots of communal land. It hadn’t occurred to me that they had ever been included in surveys as part of surrounding plots. I wonder, in fact, how this came to be. Surely, in the past these areas were treated as communal areas. In Odeungdong Village, nearby Jeju City (blog post), the leader of the recreation center for the elderly told researchers Tommy Tran, Mun Bong Sun and I, that differences in ideas about land rights were causing problems all throughout Jeju and in Odeungdong itself. “For years and years, here in Jeju we’ve never made a big deal about small pieces of land being used for traditional reasons or over small boundary discrepancies,” he said. Recently new neighbors from the mainland had requested that a stone wall be moved two feet from its current position. The wall had been in place for over a hundred years. “In Jeju, we never made a big fuss about these things, but outsiders have a different mentality.” It was the same in Seongsan. 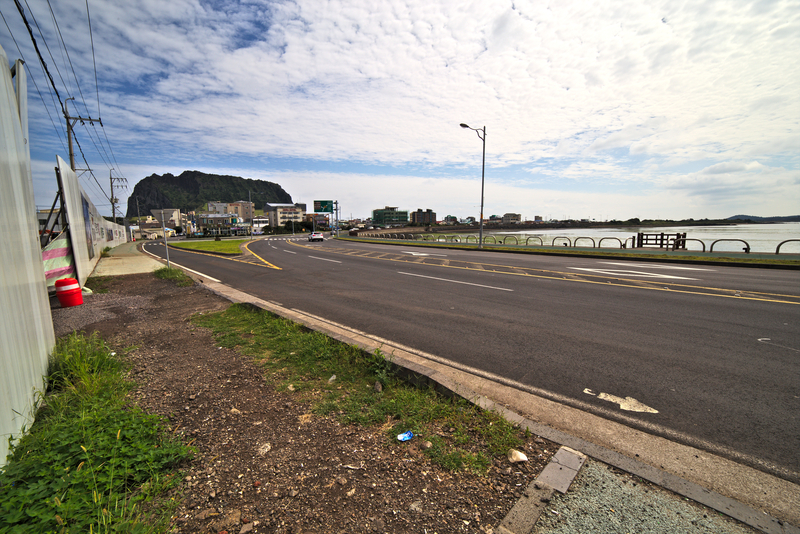 Mrs. Park, the 91 year old diver, her voice cracking from the emotion, told us that the Ilreu Shrine now under the ‘Aroha’ Hotel (it seems that the intended spelling was Aloha) parking lot had only been an area of two pyong–approximately an area of eight by eight feet. Tran and I entered the still unfinished hotel to speak with workers at a restaurant in the building. They were able to point out, just outside the window, where the Ilrue shrine had been. I asked if they were worried. Were they aware that there was an adage in Jeju dialect prohibiting the destruction of shrines, particularly that of shrine trees? (There are numerous stories of people becoming ill and even dying after such an affront to the gods on the island. It is a substantial belief.) One woman, working in the sushi establishment answered brusquely, “I know, I know.” She wasn’t worried. I realized at that moment that the concern in the village had reached their ears. I can say, after visiting the site, there is ample parking at the establishment and that the hotel would be in no way lacking if it were two parking spots short. Ample parking is available at the hotel, including a much larger parking lot on the far side of the building. Seongsan’s Ilrue shrine, where women divers and other residents worshipped, was located in the area closest to the right side of the image. Two parking spots, according to villagers, approximately cover what used to be the Ilrue shrine, a scared site in the village. A fundamental difference in culture exists between the traditional islanders and those who have come from elsewhere to settle, to capitalize on tourism or to live the ‘Jeju Dream’, a dream which commonly involves newcomers to the island embracing what they perceive as its traditional symbols. I fear the traditional islanders themselves, in this case the divers, are being condensed into mere avatars while their culture itself is under siege. 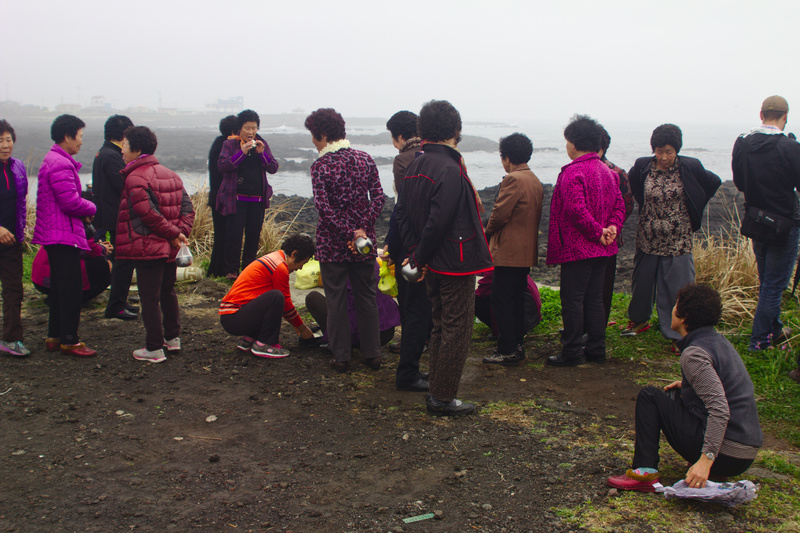 Jeju residents make offerings to the Yowang, Jeju’s sea deity. Jeju boasts 400 shrines, a large number. Yet, it is a finite number. Jeju boasts 400 shrines, a large number. Yet, it is a finite number. It might be best to remember that when Jeju is referred to as an island of myth, the myths are most closely associated with its shamanic shrines. The myths in question are the religious traditions that come out of shamanism. 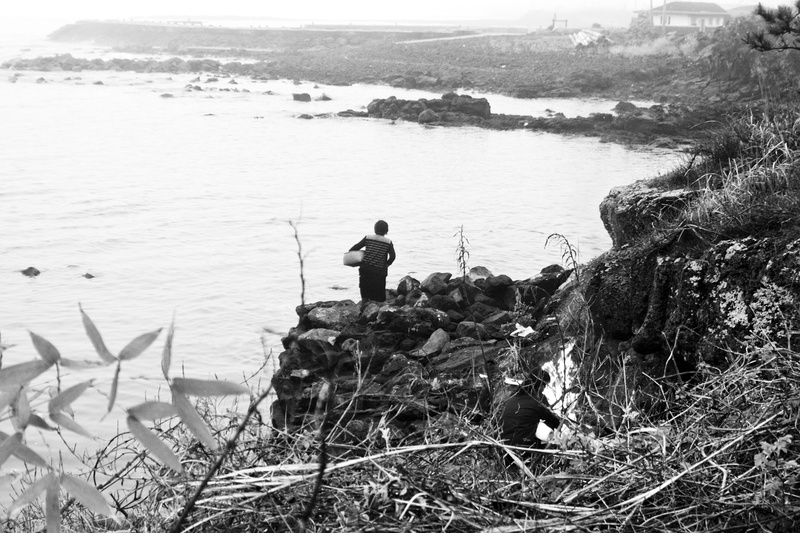 This is the first in a series of posts about Jeju Island’s destroyed shrines. I’ll be updating the situation at Sulsaemit Shrine, as well as several other shrines, in coming posts. Go HERE to learn more about the shrine which was desecrated in winter of 2013. Previous Post Jeju Island’s Deities #5: Who is the Highest Goddess in the Land? Myoungjinguk Grandmother Goddess, Giver of Life. Next Post Sulsaemit Shrine on the Verge of Being Lost?